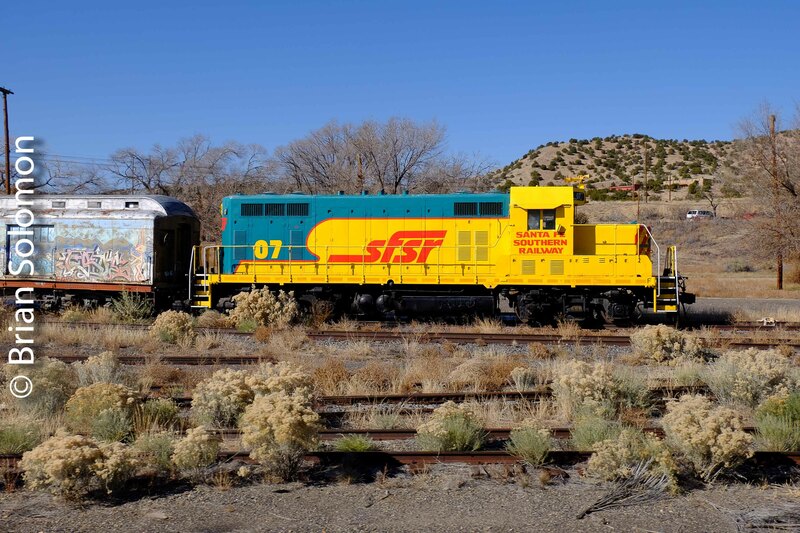 Santa Fe Intermodal from My Screen Saver File. I have a variety of my favorite images in my screen saver file that the computer brings up at random when I stop using it. 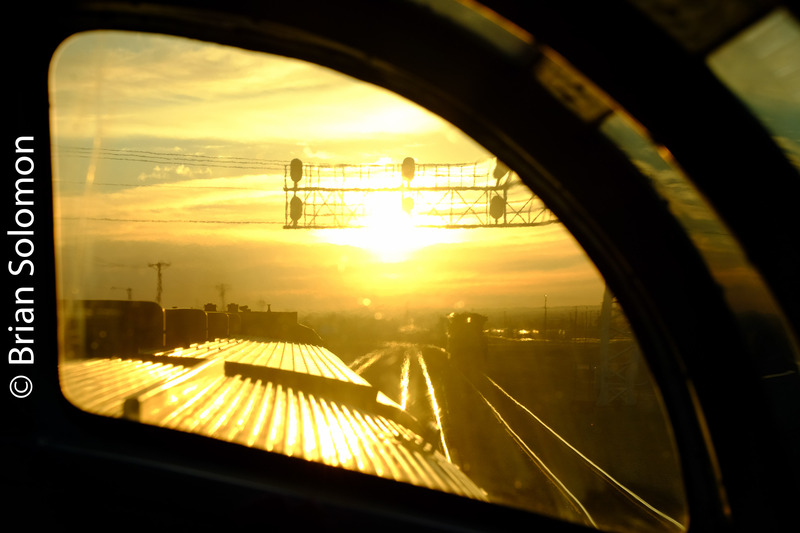 Many are railroad photos, some recent, some from the archives. One is a photo of a Shinkansen high speed train approaching Tokyo, another is a small critter on a railroad tie in Colorado, a third is a recent view on Canadian National’s Wisconsin Central on a bitterly cold evening. 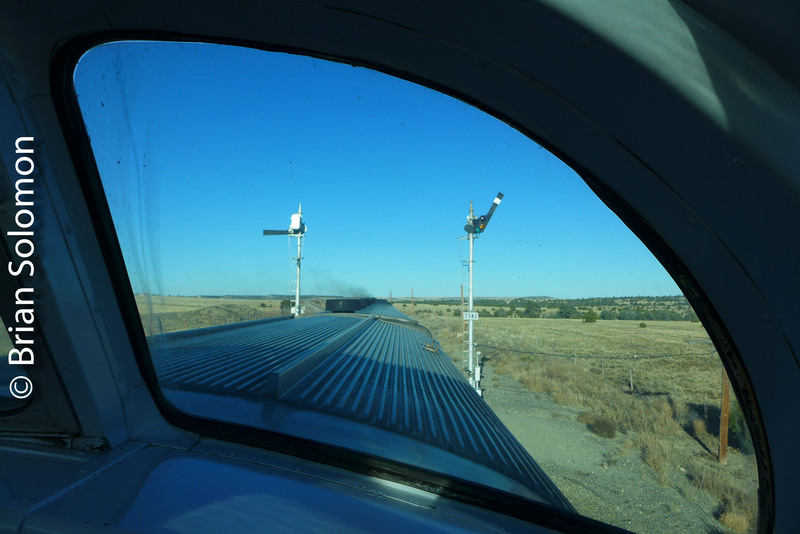 In my mix is this classic view of Santa Fe DASH8-40BW 575 racing eastward through a curve at Willard, New Mexico. I exposed it on Kodachrome 25 during a trip to California in January 1994. I worked with my old Nikon F3T with a prime 200mm Nikkor telephoto that was one of my staple lenses for many years. Tracking the Light Posts Something Different Every Day! Dusk at Raton, New Mexico. 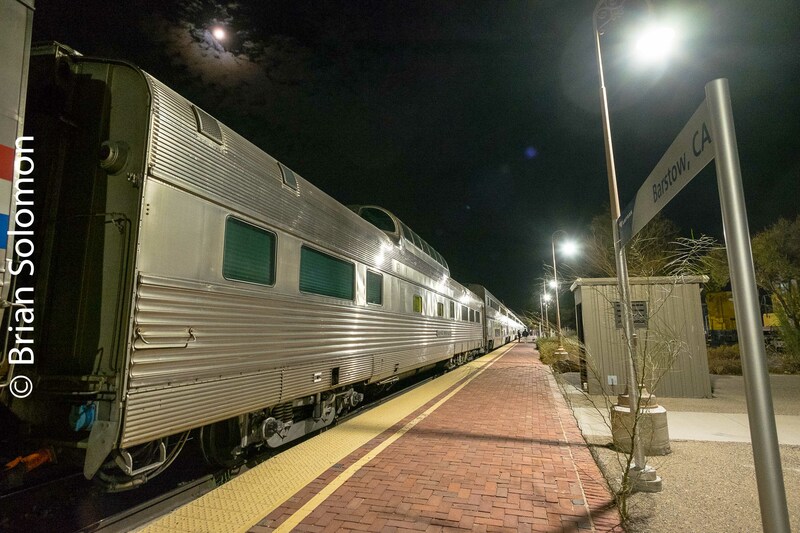 These days the only regular trains to use the old Santa Fe Raton Pass crossing are Amtrak 3 and 4, the Southwest Chief. The days of helpers over the three percent are all but a memory. This day two weeks ago: Arriving on No.4, we had more than ten minutes at Raton to stretch our legs and take in the mountain air. 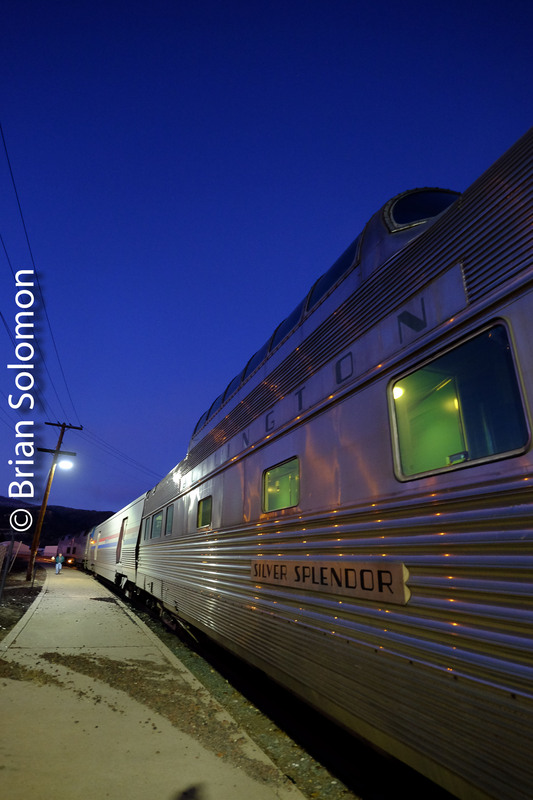 I used the opportunity to make some twilight images of Silver Splendor, the Budd-built Vista-Dome that I was traveling on. Working with my FujiFilm XT1 and Zeiss 12mm Touit lens, I exposed several views in the blue glow of evening. 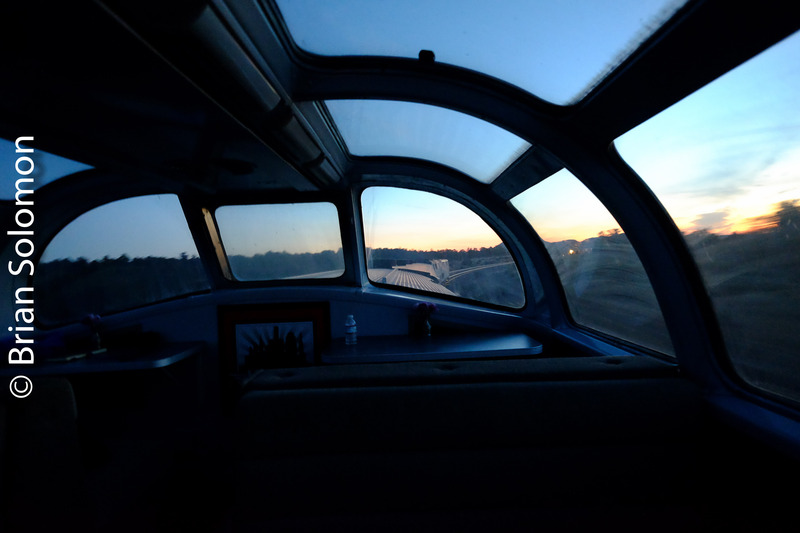 Dusk is a great time to balance the light inside the passenger car with outside illumination. f2.8 1/15th of a second, ISO 1600.
f3.6 1/15th of a second, ISO 1600.
f3.2 1/15th of a second, ISO 1600. 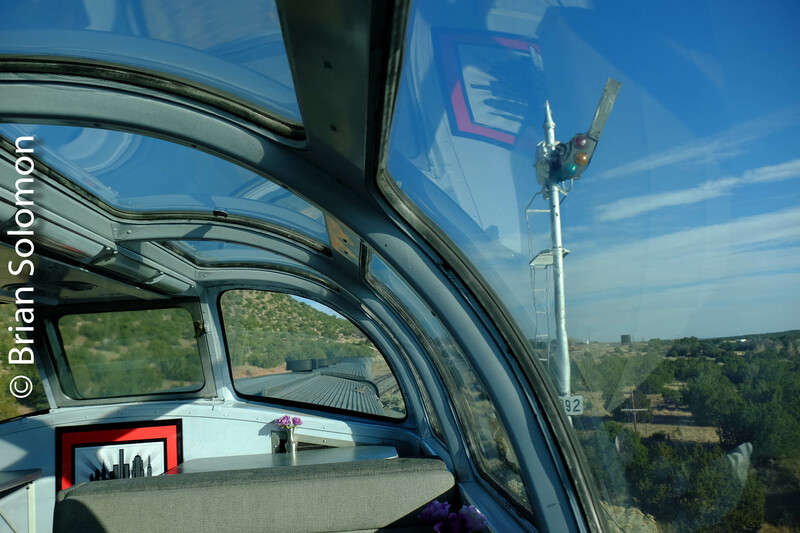 Relics at Lamy, New Mexico—November 2018. 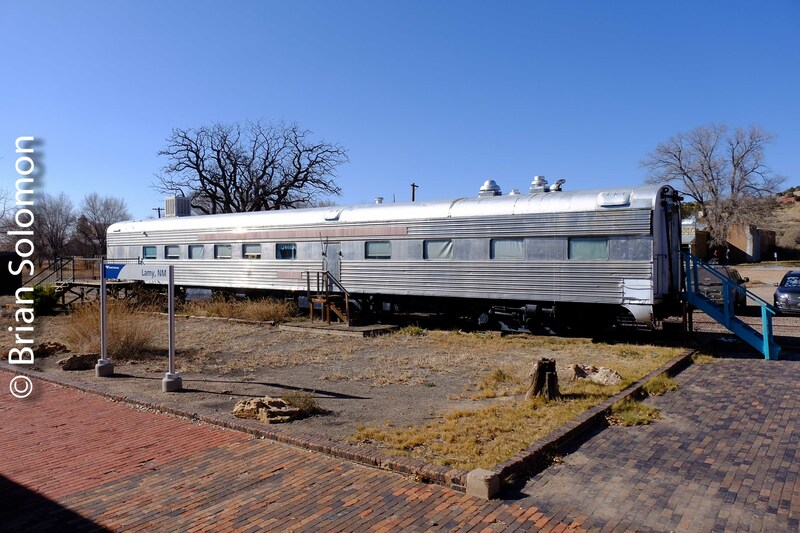 As we approached our station stop Lamy, New Mexico, I relocated from Silver Splendor’s dome, where I’d been enjoying the old Santa Fe mainline journey at the head-end of Amtrak’s Southwest Chief, tothe car’s dutch doors to make photos of antique equipment stored line-side near the station. The ability to photograph from opened dutch doors is a rare pleasure on modern trains. 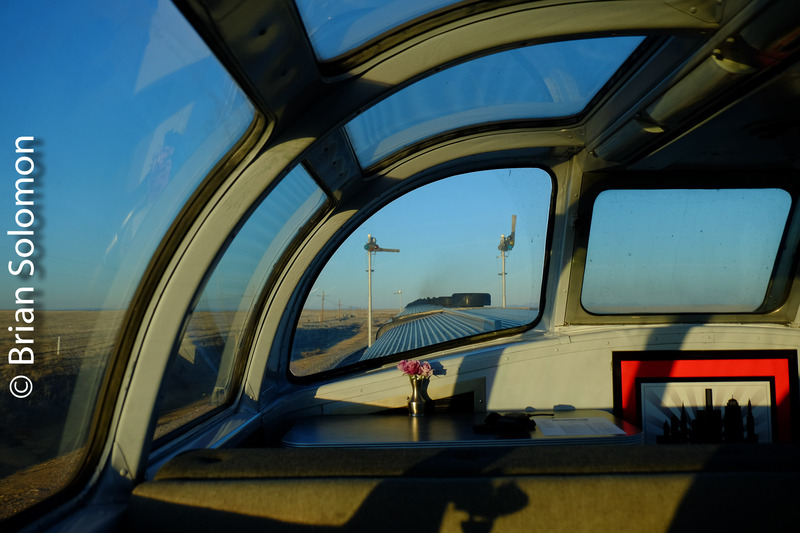 In my youth, I’d spent hours soaking in the atmosphere in the vestibules of trains, making photos with my old Leica 3A. 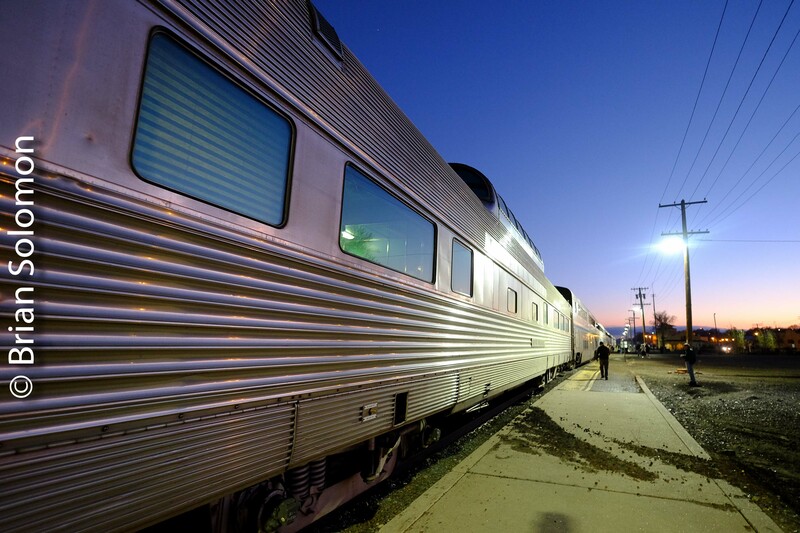 Santa Fe Southern at Lamy, New Mexico. 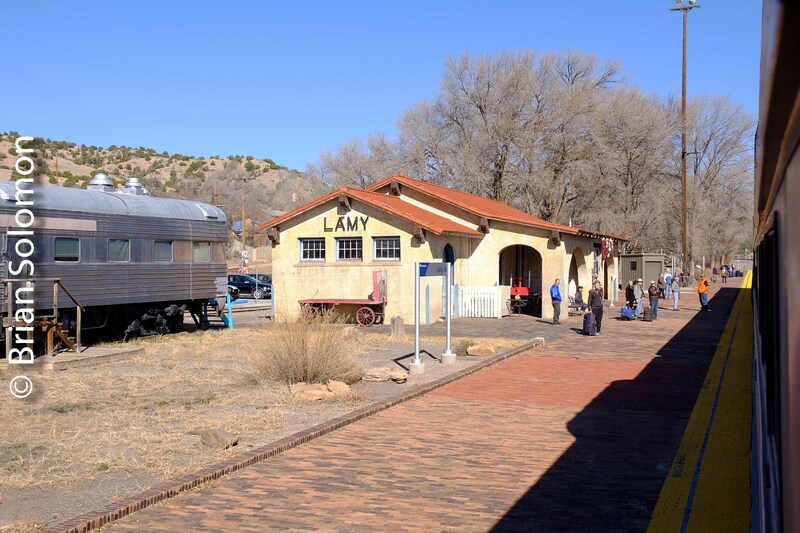 Amtrak station Lamy, New Mexico. I exposed these modern photos using my FujiFilm XT1. Brief Barstow Visit and a Flash From the Past. 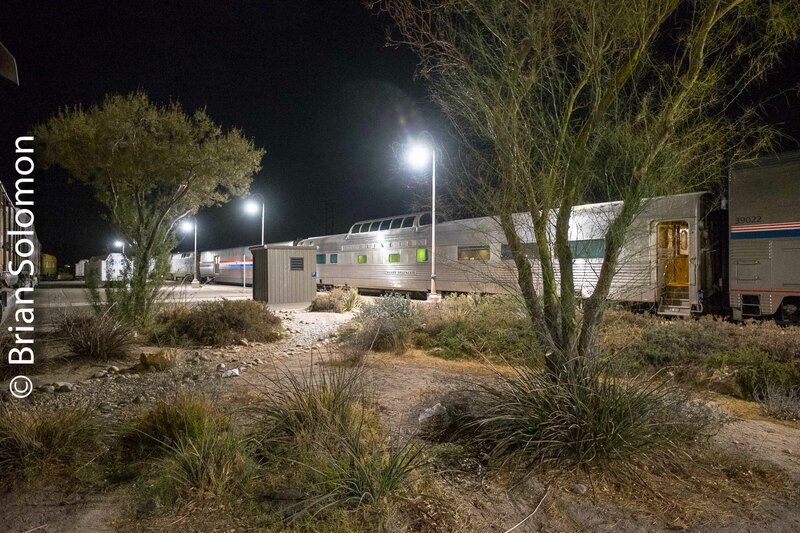 Amtrak’s eastward Southwest Chief, train number 4, made a relatively long stop at Barstow, California, affording me time to explore and photograph historic rolling stock (displayed near the platforms) by the Western America Railroad Museum. I find it strange to see once-familiar locomotives exhibited as static displays. In the 1990s, I regularly photographed Santa Fe’s FP45, such as number 95 seen at Barstow. Back then these were working machines. Today, 95 a decayed appearing vestige of another era. 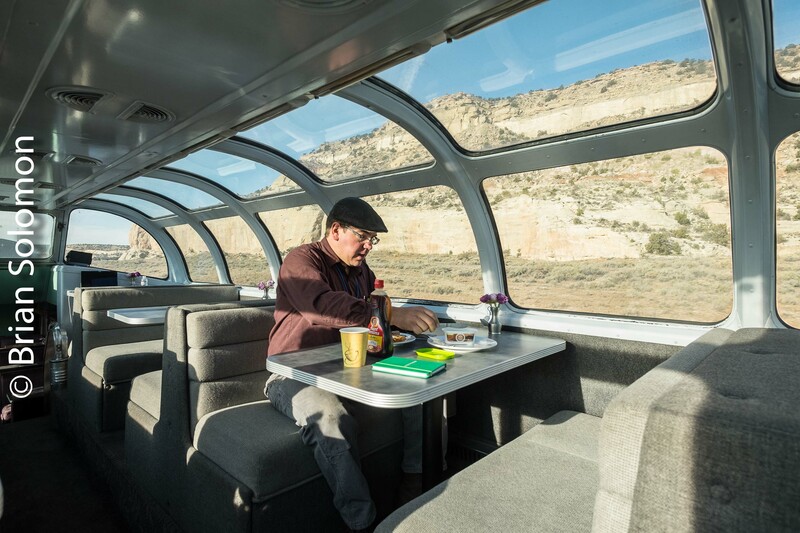 Compare the static equipment—displayed like dinosaur bones to a curious public—with Budd Vista dome Silver Splendorin consist on the Southwest Chief.The dome is a functional piece of equipment on its transcontinental journey from Los Angeles to its new home. Growing up in New England, I had a childhood fascination with Barstow, which I viewed as a treeless desert Mecca of all good things Santa Fe. 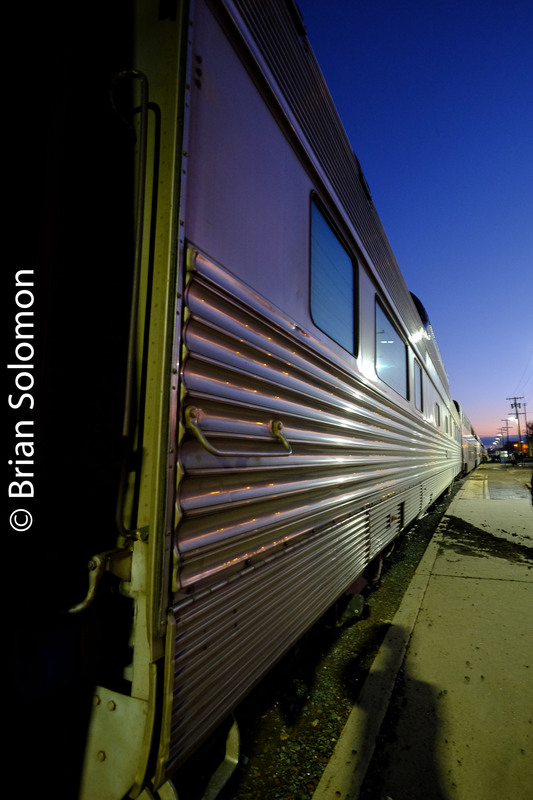 Although I’ve photographed in Barstow several times over the years, this one short nocturnal visit was especially surreal. All photos were made handheld with my FujiFilm XT1 with 12mm Zeiss Touit. 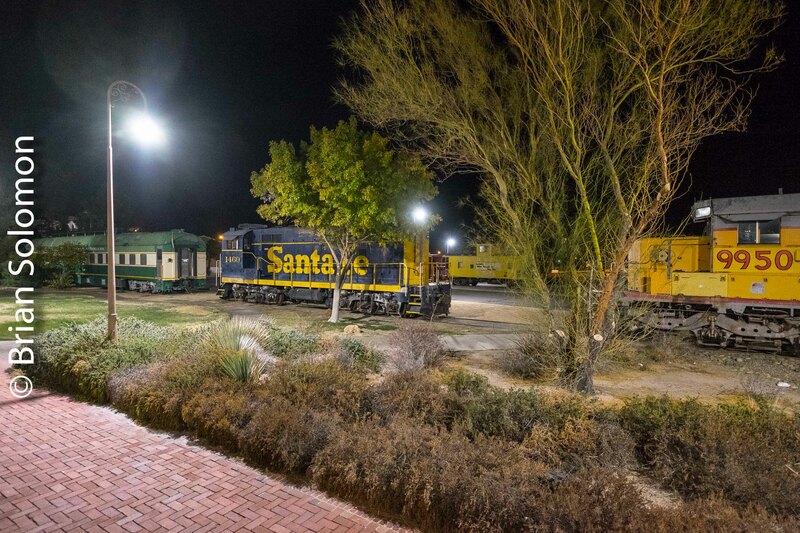 Santa Fe FP45 at Tehachapi Loop; Then and Now Comparison. My visits to California’s Tehachapis in July and August (2016) made me curious to dig deep into my archives and revisit the photographs I made there in the early 1990s. 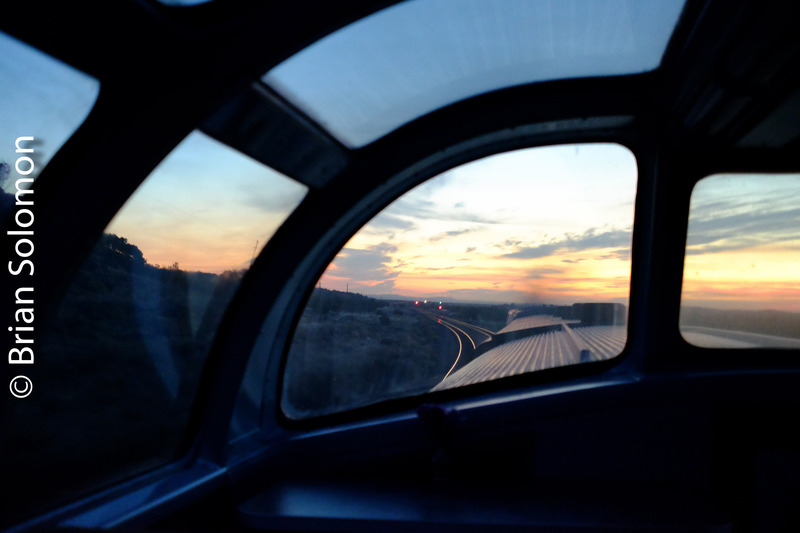 I traveled with J. D. Schmid on my first visits to Southern Pacific’s Tehachapi crossing. 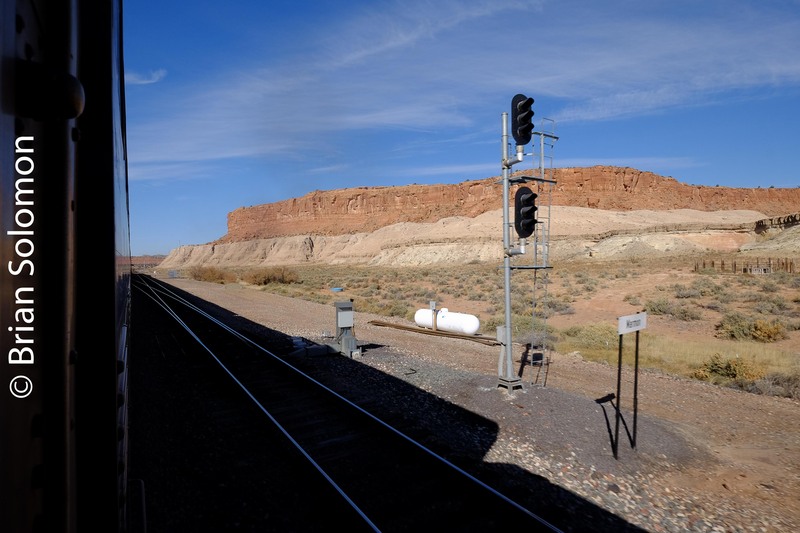 (Then Santa Fe operated in the Tehachapis via trackage rights on SP, as does BNSF on Union Pacific today). I made this Santa Fe FP45 photo on a rainy morning February 1991. We were on our way back from a detailed study of the SP’s Beaumont Hill and environs. Exposed on Kodachrome 25 using a Nikon F3T with 35mm PC lens. Santa Fe FP45 91 is the lead. 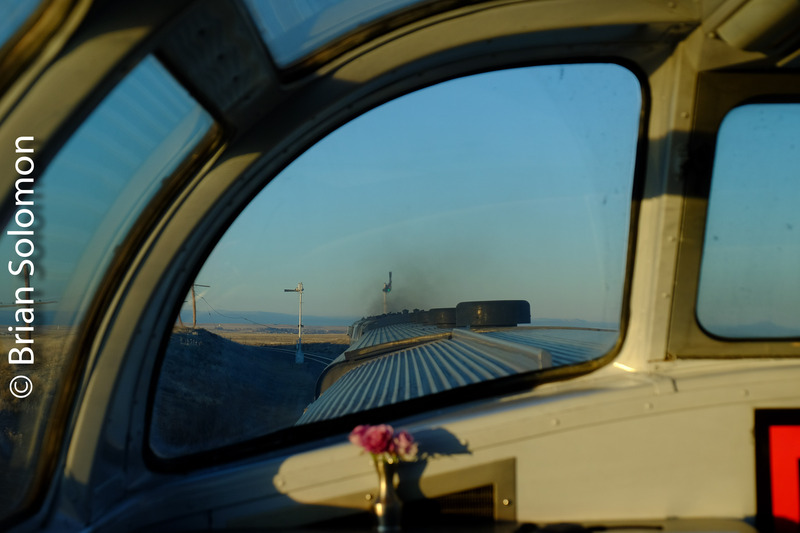 While hard to beat the great sound of EMD 20 cylinder diesels working the Tehachapi grades, it was difficult working with Kodachrome 25 to capture the experience. The film was slow and its spectral response didn’t favor dull days. Certainly the weather was better on my more recent visits. I traveled with David Hegarty, and we had ample opportunity to make photographs in the bright California sun. 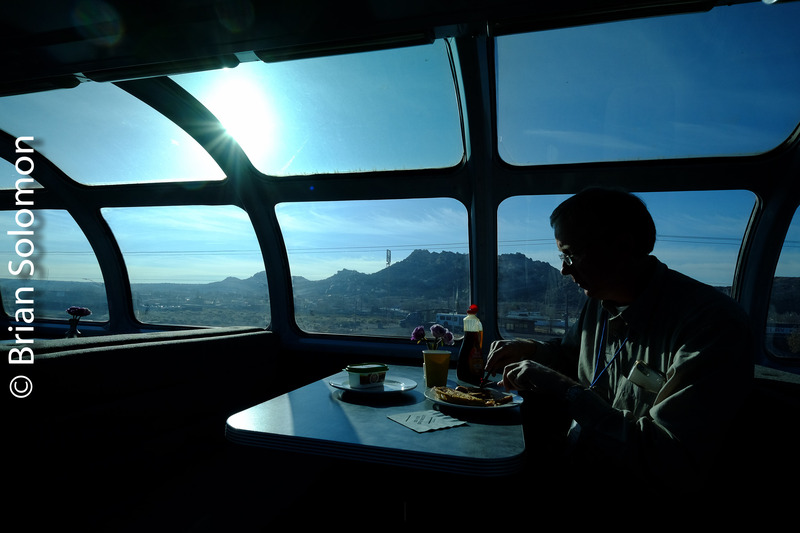 One Month Ago: In the Shadow of the Santa Fe—San Bernardino, California—Six Images. August 4, 2016 was a blistering hot day in San Bernardino. 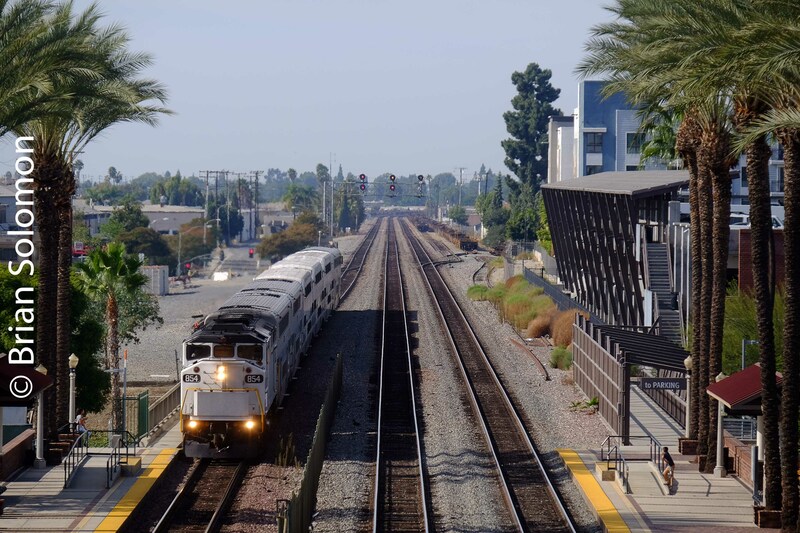 I arrived by Metrolink from Santa Ana, and departed a little while later by Metrolink for LA Union. 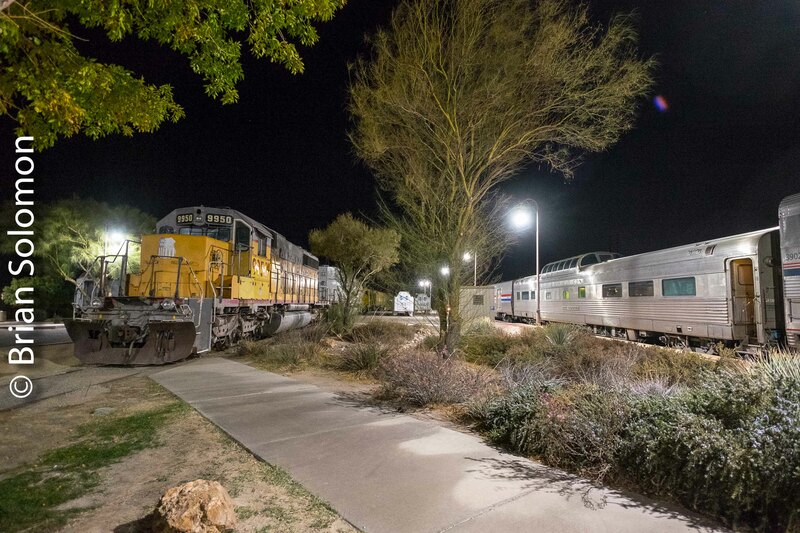 San Bernardino was a big deal on the old Santa Fe Railway; freight yards, locomotive shops, and a classic station. An old smoke stack still reads Santa Fe. 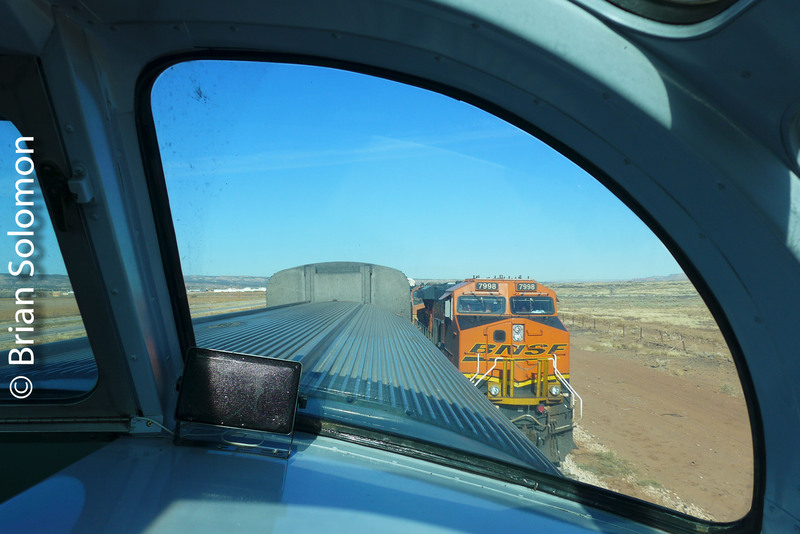 During my short visit there was a steady procession of BNSF freights. I exposed these views using my FujiFilm XT1 digital camera. In post processing, (using Lightroom) I adjusted contrast and lightened shadows to compensate for the harsh effects of midday sun. 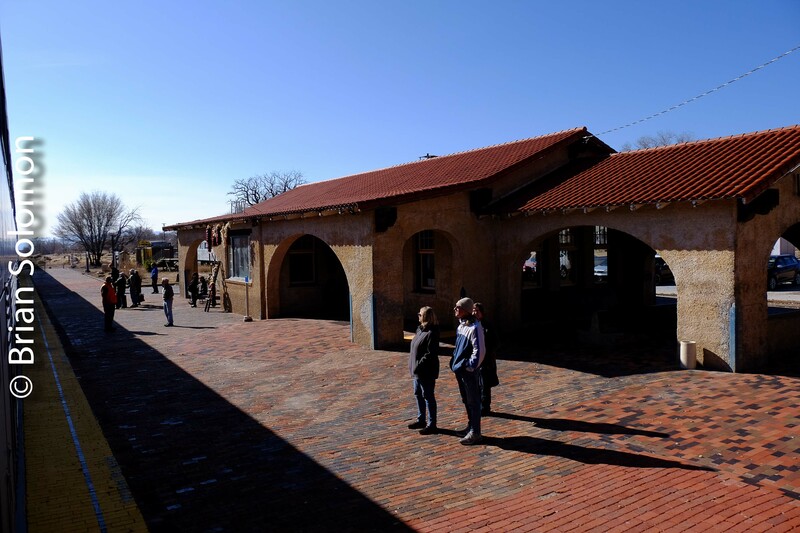 The old Santa Fe station hosts a museum and offices. Exposed using a FujiFilm XT1 with Zeiss 12mm Tuoit lens. Tehachapi Revisited—Just like I remembered, but different. 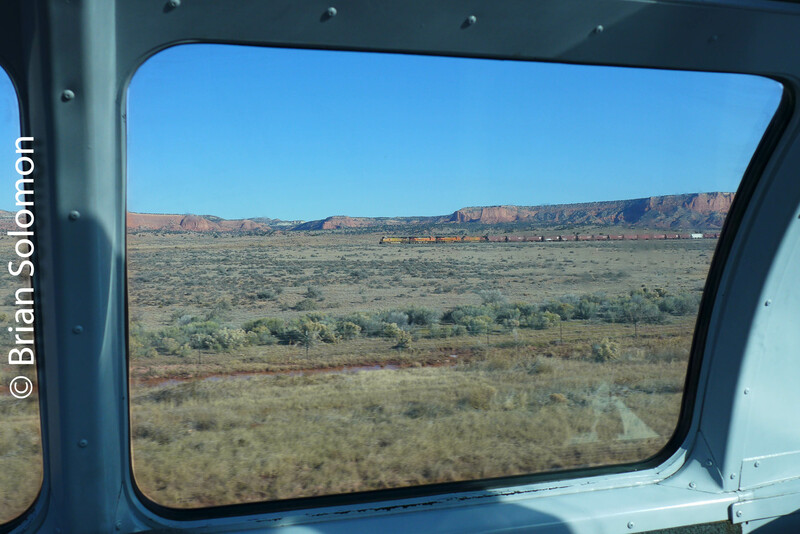 Last weekend, I gazed down upon that famous spiral officially known on the late Southern Pacific as Walong, but to the rest of the world as the ‘Tehachapi Loop’. 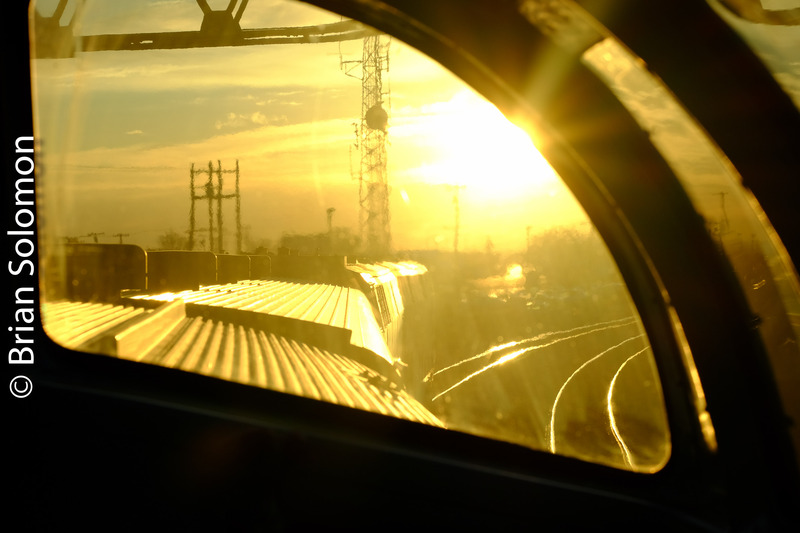 It was, and still is, one of the great places to watch trains; and on this day it didn’t disappoint. I’d been away a long time and now I was back. The last time I was here, I’d stayed with my friends Dave and Helen Burton, who lived just over the hill on the north side of the spiral. 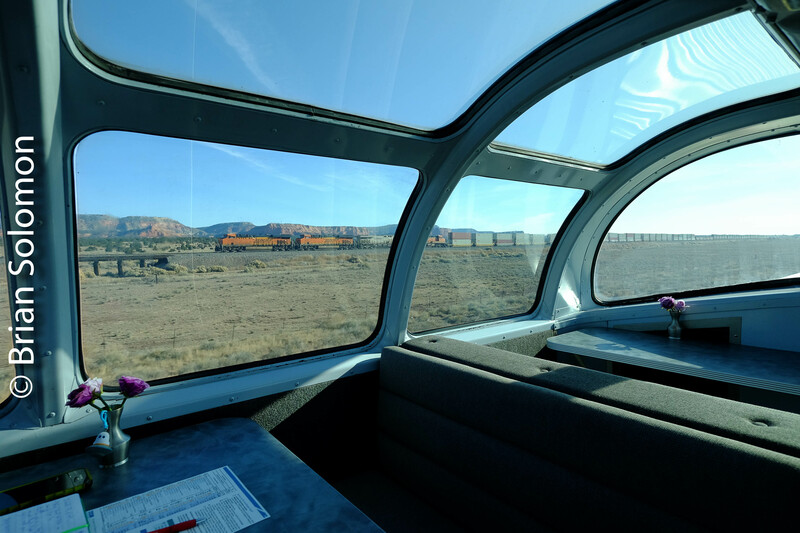 Back then, Southern Pacific still owned the line, and the merger that was to consume the Santa Fe Railway was still more than a year away. Now, SP, Santa Fe, and Dave and Helen are all just memories. 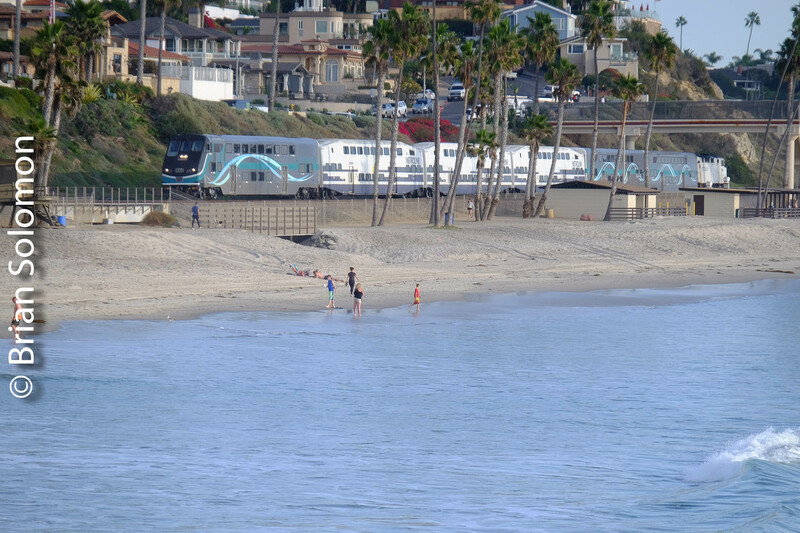 It was strange to watch a train traverse the loop. I was delighted to see it, but sad. It was like seeing some weird vision of the future. So, I made these images—my first digital photos of this often-photographed landmark—while thinking back to earlier times. I dedicated books to both of my friends: to Dave, I dedicated my BNSF book of 2005. Santa Fe at Christie, California. On March 23, 1993, I exposed this Kodachrome slide of Santa Fe tracks and code lines at Christie, California. Exposed on Kodachrome 25 with a Nikon F3T. Tracking the Light is on autopilot! While I’m on the road in late July 2015, I thought it would be nice to look back to August 1993. 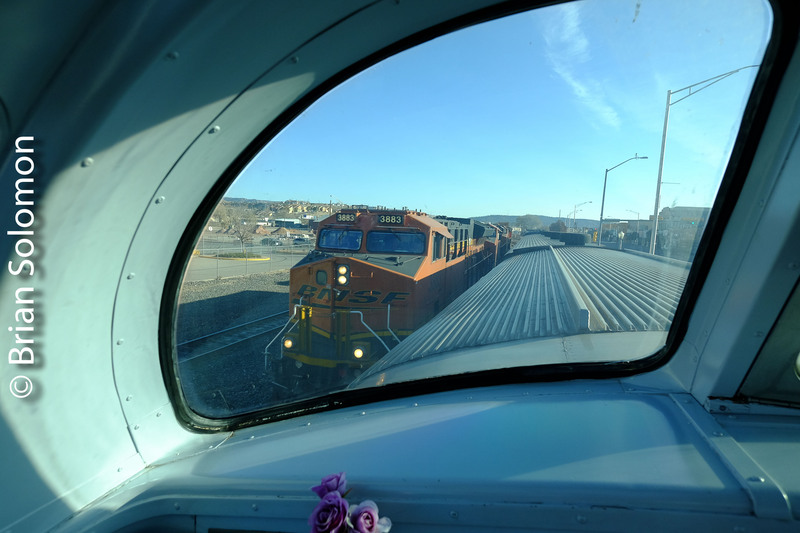 I made this view on the Santa Fe of an eastward GP60M at Port Chicago, California. Exposed on Kodachrome 25 using an F3T with 35mm PC lens. Perspective control made this angle possible. 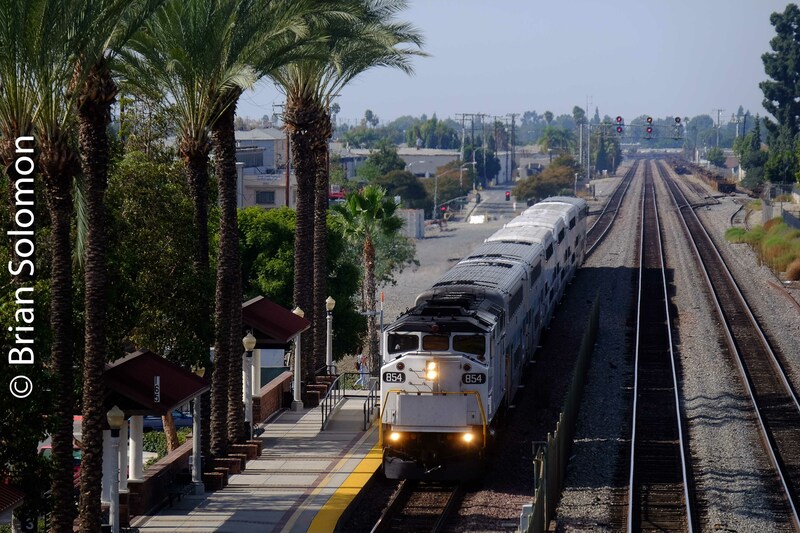 When I was exploring Santa Fe’s Bay Area operations in the early 1990s, the railroad tended to operate a fleet of westward trains to its Richmond, California yards in the afternoon and early evening. One afternoon, Brian Jennison and I had set up at the Alhambra Viaduct near Martinez. This was a relatively scenic portion of the line, but beginning to get hemmed in by suburban growth. We knew that the 899 was on its way. This was a short high-priority piggy back train. The real prize of the day was the premier 199, which often had new ‘Super Fleet’ locomotives wearing the reintroduced Warbonnet paint scheme. 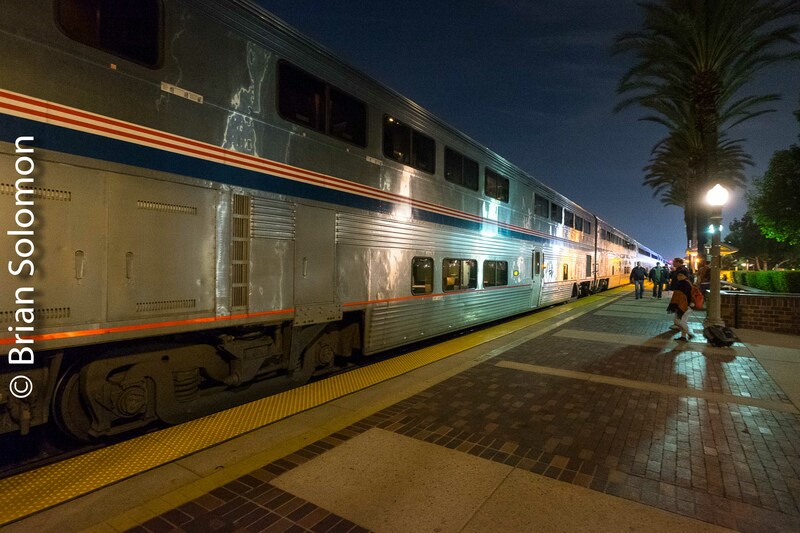 But we wanted to make the most of the short train as we had time to make different photos of both trains. To make the most of Santa Fe’s ‘shorty’ 899, I climbed atop the tunnel west of the bridge, and set up this view using my Nikon F3T fitted with a Nikkor f4.0 200mm lens. 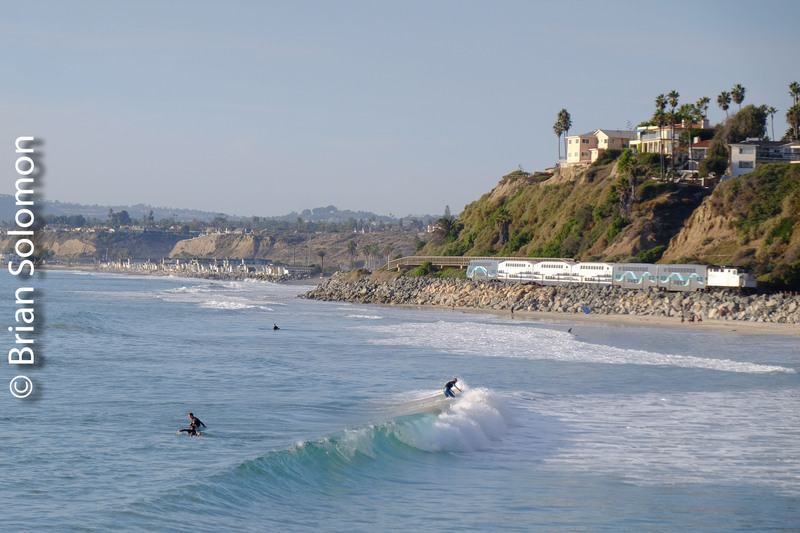 The light was classic California blue skies with soft autumnal haze that favored Kodachrome 25. My exposure was f5.6 1/250th of second. This view minimized the suburban sprawl on both sides of the bridge, along with high tension lines in the valley, while putting the steel viaduct in a good perspective. Was it really 24 years ago? 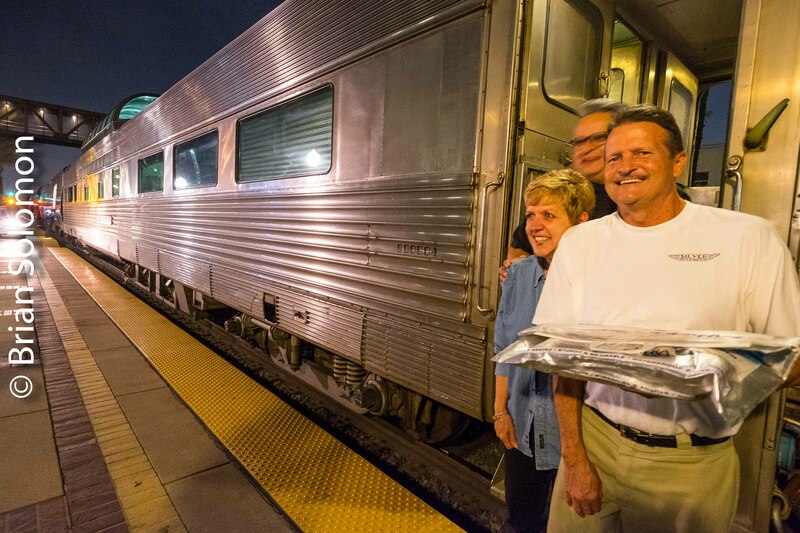 Santa Fe Freight Cars on the Roll! Free Film and a Borrowed Camera. It was autumn 1986. As a photography student at the Rochester Institute of Technology, I’d receive an annual ‘care package’ of new, and sometimes experimental, Kodak products. At the time I was a loyal Kodak film user, and dedicated to the careful exposure of Kodachrome 25. However, since I was on a shoe-string budget, I was happy to make use of the free roll of ‘Ektachrome du jour’—as we’d call whatever the latest flavor of Ektachrome was being peddled at the time. Blessed with a rare bright day, and armed with my free roll of film, I wandered around Rochester documenting the railroads and the city. I had K25 in my Leica for the important photos, and loaded the free film into my roommate’s Canon A1 for experimental shots and comparison views. 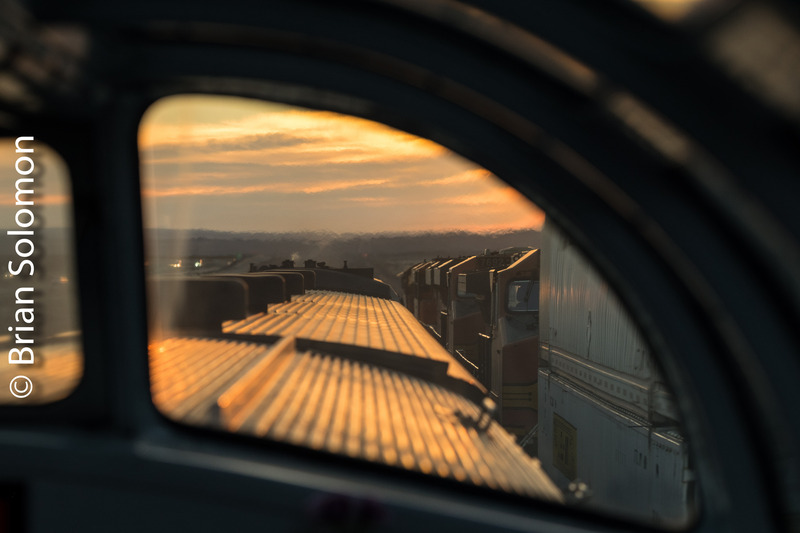 I exposed this slide of Santa Fe freight cars on a westward Conrail freight using the Canon A1 fitted with a 50mm lens. I panned using a 1/30th of second to convey a sense of motion. DAILY POST: Santa Fe in the Tehachapis, 1993. Warbonnets among Iridescent Rolling Hills. 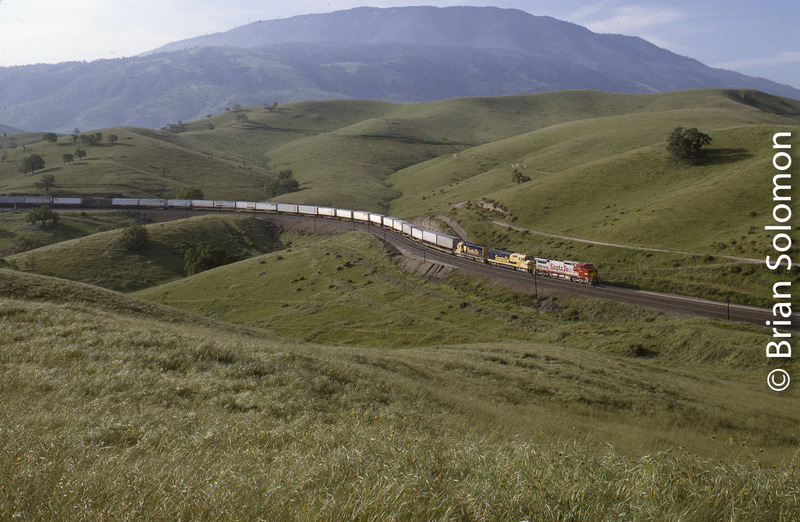 The head-end of Santa Fe’s second 199 works Southern Pacific rails in the Tehachapis between tunnel 1 and 2 near Bealville, California at 7:45am on April 3, 1993. I exposed this photo on Kodachrome 25 slide film using a Nikon F3T with 35mm lens at f4.5 1/125 second. Here’s a secret: the F3T has a removable prism; and to make this image, I pre-focused then took the prism off and held the camera close to the ground. Incidentally this means I composed the image in reverse. At the time, my camera didn’t have a motor drive, so this was a one shot effort. Take careful notice of the lighting and focus points. 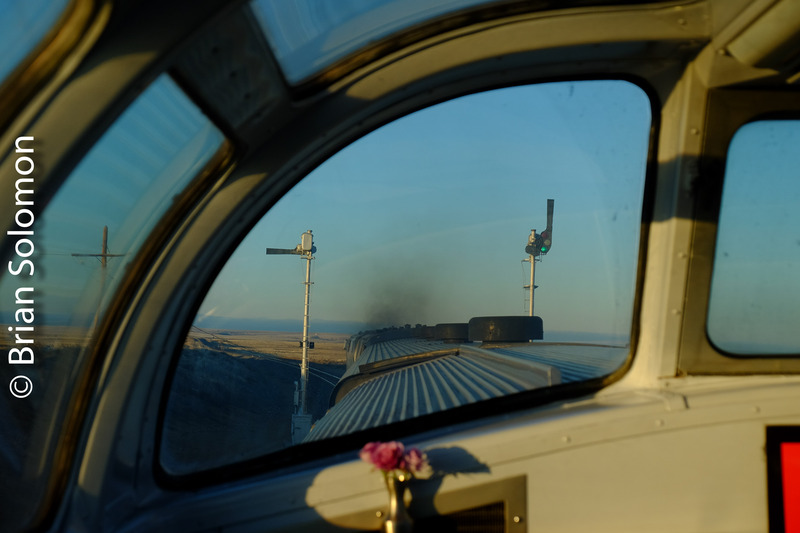 California’s rolling Tehachapi mountains south of Bakersfield is one of the West’s great places to watch and photograph trains. Here through creative use of scale, depth-of-field and backlighting, I’ve made a real railroad look like a model! In the early 1990s, I made several productive trips there. 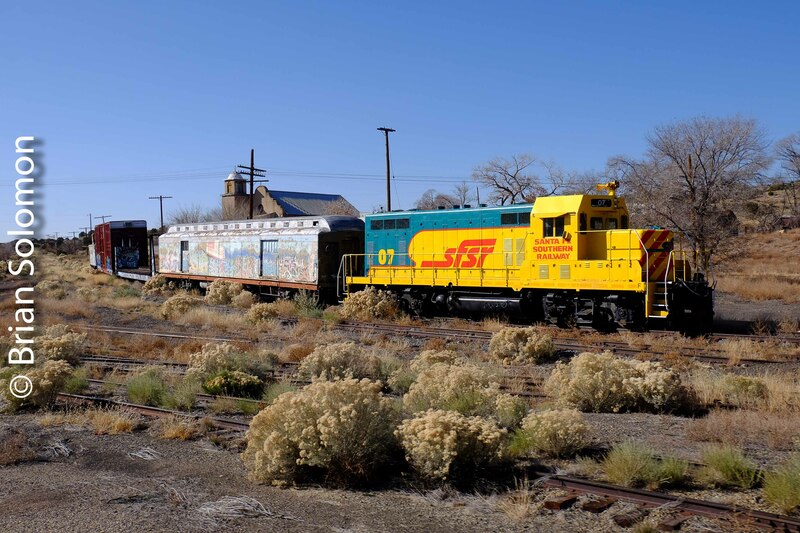 In Spring 1993, Brian Jennison and spent a few great days making images of SP and Santa Fe trains. On this morning we were joined by local photographers Bruce Perry and the late David Burton. On the morning of April 3, 1993, I climbed a grassy hill near Bealeville to make this image of Santa Fe’s westward second 199 winding its way downgrade between tunnels 1 and 2. Working with my Nikon F3T and 35mm PC lens, I played with focus and scale to make an image that looks like one exposed on a model railway. 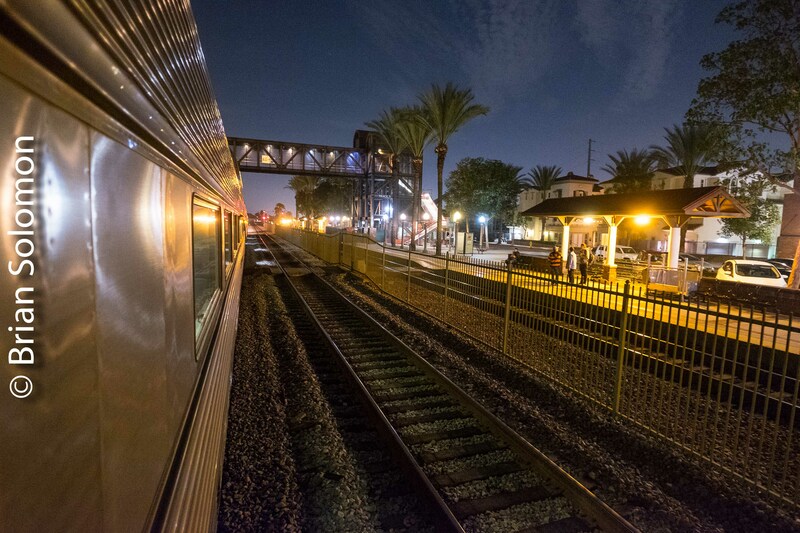 This was my way to cope with some difficult lighting on a photogenic subject and following in the California tradition, I’ve micturated on established ‘rules’ of conventional railroad photography. I’ve always liked the purple lupin in the foreground. 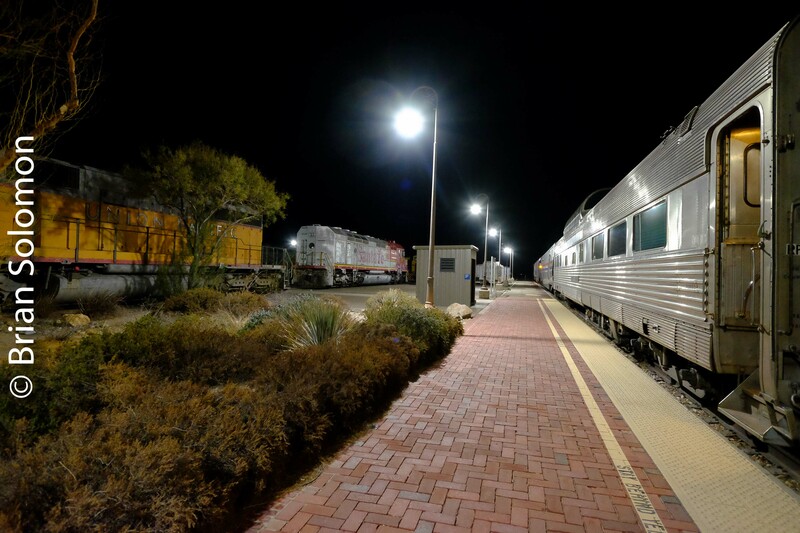 Santa Fe EMD-built FP45 number 98 eastbound near Mojave, California. I exposed this on Kodachrome 25 using my Nikon F3T with an f4.0 200mm lens positioned on a Bogan 3021 tripod with ball head. 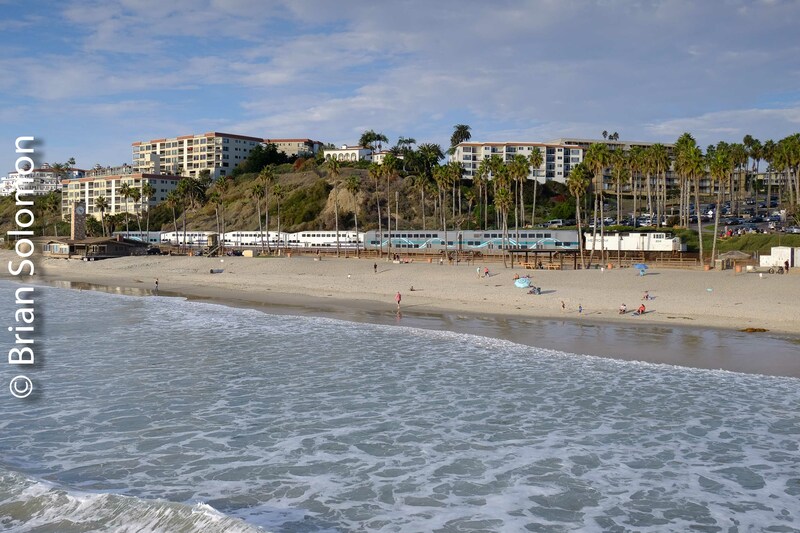 In the early 1990s, I made several productive trips to the California Tehachapis. 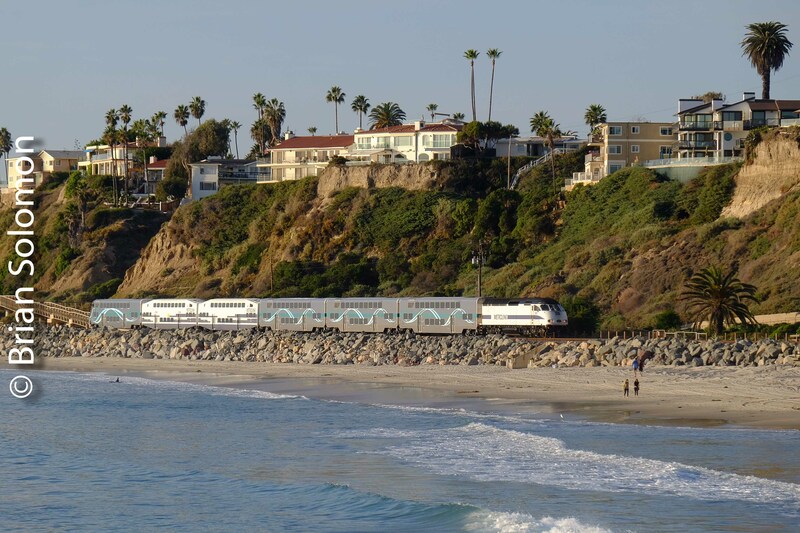 Southern Pacific owned and operated the line over the mountain, while Santa Fe operated by virtue of trackage rights. 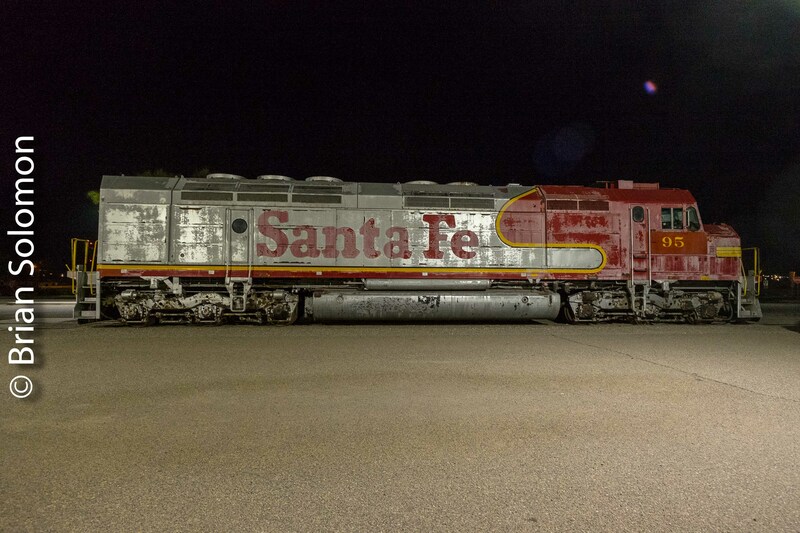 Yet at that time, Santa Fe ran about three times the number of trains as SP. On this morning, T.S. Hoover and I were set-up on the east slope of the mountain. 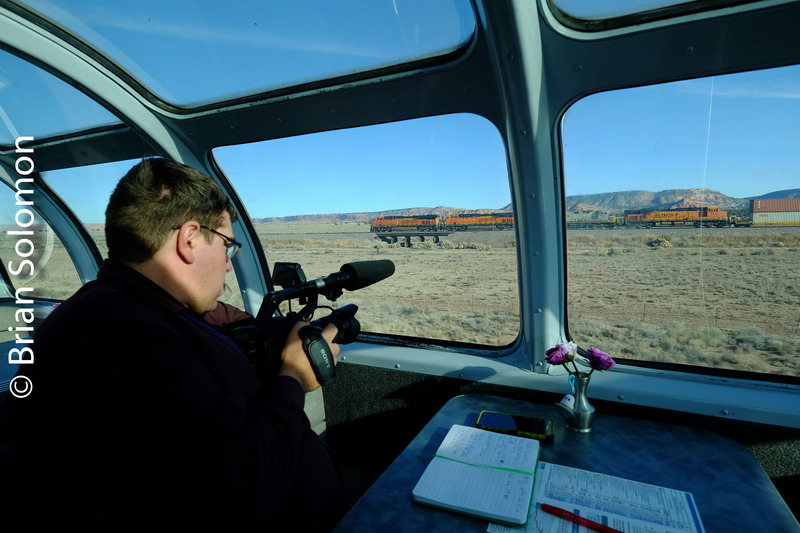 While catching a Santa Fe FP45 in the ‘Super Fleet-Warbonnet’ livery leading was certainly a coup, it wasn’t especially unusual. Dry desert air and clear skies were nearly ideal conditions for Kodachrome 25 film. This was one of many choice chromes exposed that day. I wish I could turn back the clock! 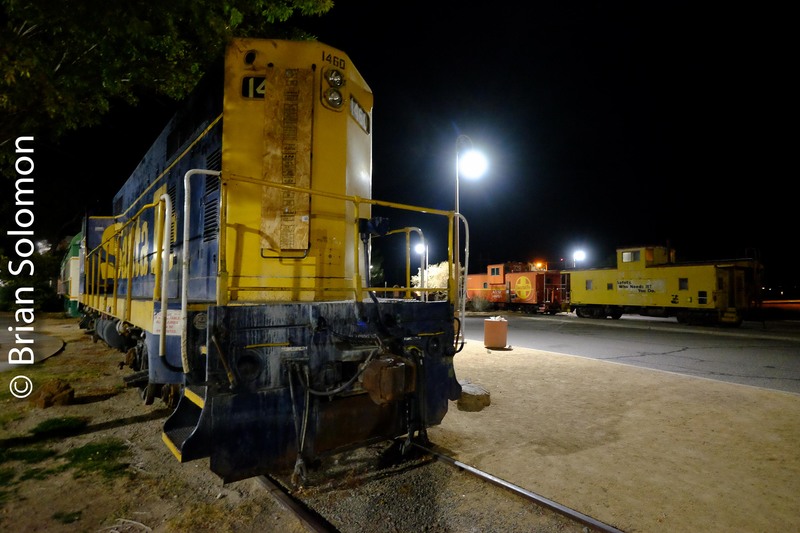 The locomotive survives at the Orange Empire Railway Museum in Perris, California. I made some more recent photographs of it on visit in June 2008.